Strategi: Hillary Clintons permanenta kampanj! VAL 2016 | Om Hillary Clinton vinner valet beror det till stor del på att man lyckats knäcka koden för hur en modern politisk kampanjorganisation skall se ut. 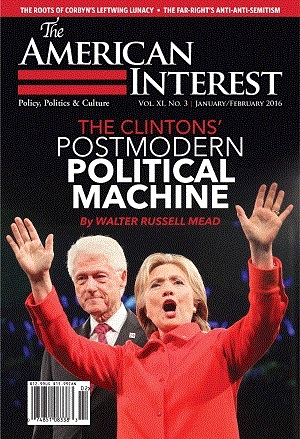 Bill Clinton och Hillary Clinton har sakta men säkert över åren byggt upp vad professor Walter Russel Mead på The American Interest kallar “The First Postmodern Political Machine”. The contrast between the apparent inevitability that surrounded Hillary Clinton’s procession toward the Democratic presidential nomination for so long and the air of scandal and suspicion that seems to trail behind her wherever she goes is striking. And it points to something important: Hillary Clinton isn’t a candidate borne aloft on a wave of popular enthusiasm. She is no JFK, no Ronald Reagan. She is no George Wallace or William Jennings Bryan. The marching bands processing before her have to be paid; she can’t fill vast halls with cheering throngs like Bernie Sanders or, heaven help us, Donald Trump. But she soldiers gamely on, determined to struggle through the exhausting and degrading routine of the eternal campaign. But determination and grit aren’t the only forces behind her. To understand the Clinton candidacy and the odd mix of acceptance and resistance it conjures up in the party, one has to understand that she represents something that is at once very old and very new in American politics. She is a machine politician, but the machine behind her is a new kind of American political machine: a postmodern one. There seem to be four pillars for this new kind of edifice. First, there are the unintended consequences of the dysfunctional campaign finance “reforms” over the past thirty years that gutted traditional party organizations while empowering billionaires. Both the Democratic and Republican parties are, institutionally speaking, mere shadows of their former selves. Second, there is the synergy created by the intersection of the Power Couple and the Twenty-second Amendment, which limited Presidents to two terms. Term-limited Presidents have a hard time convincing donors that further gifts will result in future benefits. This is a problem the Clintons do not have. Hillary Clinton is the first person who can convince power brokers that she’s ready to make the transition from FLOTUS to POTUS. What the Clintons have figured out is that a successful Power Couple can stay at the top of national life for decades—two terms for the first member, an interregnum of unspecified length followed, hopefully, but two terms for the second member, by which time the torch may have passed to a new generation. Third, the Foundation vehicle allows the Clintons to attract enormous sums of money from foreign as well as domestic donors. Unlike ordinary politicians, the Clintons can take money from foreign individuals, states and firms without breaking US laws. They can even sidestep much if not all of the odium that comes from running an American campaign with foreign money. Raising money to fight breast cancer in Botswana is a much more creditable activity than taking political contributions from an African mining company with a dubious reputation. …] This is honest graft at work: one hires someone who is a reasonably qualified administrator for the program, but who is also plugged into the network of activists and operatives needed to keep the permanent campaign up and running. One can also spread the money around: the Clinton Foundation can make grants to other like minded non-profits, providing good jobs to loyal supporters. Patronage in the service of doing good, that can effectively and legally use foreign donations in ways that build a powerful domestic political force: this might not be up there with the discovery of fire or the wheel as an invention that changes history, but it is not an insignificant contribution to the art of American governance. Fourth, the Clintons have captured the power of networks. Like Facebook, the Clinton network is powerful because almost everyone is part of it. Since 1992, when the Clintons stormed out of Arkansas to take the White House, they have been at the center of world power and fame. Everybody who is anybody knows them or knows of them. They can introduce anybody to anybody; they can put together the most star-studded guest list for any purpose. The power of celebrity gives them the ability to publicize and glamorize almost anything; there are powerful reasons to be part of the network that includes virtually everyone in the media, in government, in finance, in business or academia that anyone wants to know or do business with. Many find something deeply repellent in the ways that the new machine facilitates the integration of global and American politics and lobbying. Many will denounce the self-interested mingling of charity and political power-broking; others will gasp at the depth and degree of conflict of interest that a system like this inevitably entails. All these problems are real, and the Clintons, whatever their virtues, have never been at their best when it comes to disentangling the public good and their political interests. Even the power of a great political machine cannot (yet?) deliver electoral victory on a national scale. Barack Obama (who seems increasingly interested in setting up a rival postmodern machine when his own presidency comes to an end) can tell us about that. In the old days, machine politicians had a hard time winning national campaigns; people out in the less corrupted (or, if you prefer, less sophisticated) flyover states aren’t always happy about big city politicians with big city connections. Tidskriftsomslag: The American Interest, vol. XI, nummer 3, januari-februari 2016. 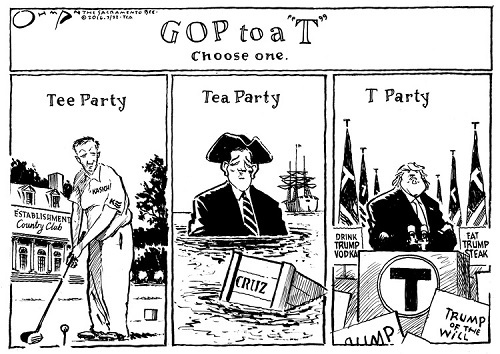 Editorial Cartoon: Partifalanger inom GOP! Bild: Jack Ohman. Fler av Ohmans teckningar på GoComics. Strategi: Ett behagligt problem för (SD)! VÄGVAL | Sverigedemokraterna tappar i opinionsundersökningar men ligger tryggt kvar som Sveriges tredje största parti. I Novus senaste väljarbarometer för mars månad kan man dock se en viss uppgång om än högst marginell. Enligt Torbjörn Nilsson i Fokus är man inom partiledningen inte ense om vad opinionsläget kommer att ställa för krav på partiet framöver. 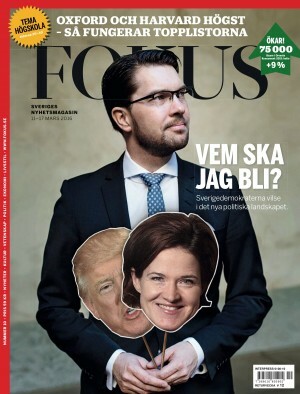 Å ena sidan är något slags seger bärgad, realpolitiska framgångar nådda och partiet delvis normaliserat. Å andra sidan sjunker opinionsresultaten, medierna är inte lika intresserade längre och borta är den så kallade sjuklöver man kunde skylla allt på och ständigt kontrastera emot. Vad ska sverigedemokraterna vara bra för när både moderaterna och regeringen tagit över deras åsikter om migration? Vad ska sverigedemokraterna vara bra för när både moderaterna och regeringen tagit över deras åsikter om migration? De mer populistiskt lagda tycker med emfas att moderaterna inte ska få komma undan med sin omsvängning i migrationspolitiken. De säger sig vilja syna bluffen, ropa vi-var-först och vilja syna bluffen och visa att moderaterna saknar såväl radikalitet som handlingskraft för att utgöra ett alternativ till regeringen. De mer tålmodigt lagda anser att moderaterna gärna får vinna en procentenhet eller tre av sverigedemokraterna eftersom det förväntas stärka den falang i moderaterna som drivit omsvängningen och som antas vara mest benägna att börja samarbeta med sverigedemokraterna. Och vi får anta att partiet kommer att lägga en eller annan krona på fokusgrupper för att utröna vad väljarna finner vara mest tilltalande – och därmed också det som gynnar Sverigedemokraterna mest. Tidskriftsomslag: Fokus, 11-17 mars 2016. Bild: JFK och mordet på Patrice Lumumba! 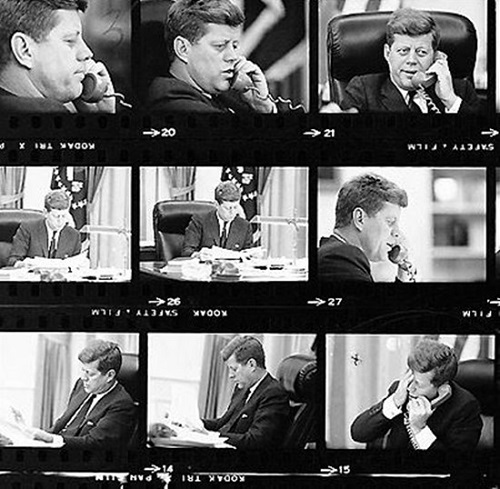 President John F. Kennedy får nyheten att kongolesen Patrice Lumumba har blivit mördad. året är 1961. VAL 2016 | Att ständigt vara på offensiven är Donald Trumps kampanjstrategi. Så här långt har det fungerat mer än väl. Roger Stone, Trumps tidigare politiska rådgivare, kallar det för ”tribal warfare”. Genom att definiera vem som är ens motståndare definierar man också sig själv. Detta får också till konsekvens att man blir mindre sårbar för motståndarnas försök att klistra sina egna etiketter på en blir mindre effektivt. On the campaign trail, he leans on stereotypes to explain the world, in ways both inflammatory and complimentary. Persians are “great negotiators.” Hispanics are “incredible workers.” Mexicans illegally crossing the Southern border are “criminals” and “rapists.” After the terrorist attacks in San Bernardino, he proposed a blanket ban on immigration by Muslims, not just those with radical Islamic ties. But nobody does tribal warfare like Trump. “It’s us-against-them politics,” says Roger Stone, a Republican consultant and former Trump adviser. “You define yourself by who your enemies are.” Trump has been a master of this for much of his life. At various chapters in his business career, he has found the furrows in the cultural landscape and sown discord for personal gain. Now the same knack for divisive rhetoric could tear the Republican Party in two, leaving Trump as the commander of a new tribe, a coalition of the disaffected. But there is no tribe Trump condemns more than the political elites, both Democratic and Republican. “The Republican Party, insofar as it is in favor of a lot of immigration and a lot of things that go on with globalization, are feeding the kinds of problems that are creating the anger,” says political scientist Charles Murray of the conservative American Enterprise Institute, who argues that the policies of the GOP establishment have hollowed out the party’s white working-class base. Generations of Republican leaders have exalted free trade and entitlement cuts, called for more high-skilled-labor visas and guest workers, sought deep tax reductions for the wealthy and pushed for tougher antiabortion policies and less federal meddling. In each case, Trump has defied party dogma. He’s pitched protectionism and stronger social programs, a border wall and a wealth tax. He defends the merits of Planned Parenthood and eminent domain. From this vantage, Trump’s groundswell of support isn’t a spasm of a party in chaos. It looks more like a natural course correction. He hasn’t dragooned supporters into believing he’s a conservative; he’s leading a willing rebellion against modern conservatism itself. Läs mer: David Von Drehles ”Donald Trump’s Wild Ride”. Tidskriftsomslag: Time, 14 mars 2016. Image: Hillary Clinton är som en nyttig sallad! VAL 2016 | Hillary Clintons största problem är att hon är Hillary Clinton. Detta enligt Joe Klein i tidskriften Time. Klein, som bl.a. skrev boken The Natural om Bill Clinton, har bl.a. kallat henne en ”quinoa and kale salad, nutritious but bland”. Clinton har varit ständigt närvarande i amerikansk politik. Hon är alltid närvarande. Hon skulle aldrig som Bill Clinton kunna kalla sig för ”Comeback Kid” ”because she never really goes away, she just keeps plugging away, pocketing any stray piece of progress that she can”. Bernie Sanders, hennes politiska motståndare i demokraterna, må entusiasmera ungdomar men när allt kommer till kritan är och förblir Clinton det säkra kortet. Och när väljarna skall avgöra vem som är mest lämplig att fatta beslut om krig och fred – hon eller den fullständigt oförutsägbara tornadon Donald Trump – kommer man med största sannolikhet att välja Clinton. Eller som amerikanarna själva brukar säga: ”Steady does it”. This is what Clinton brings to the table in this campaign, an idealism tempered by time and hard experience. She has become more realistic, and moderate, because–unlike Sanders, who has existed on the periphery of practical politics–she knows what it’s like to lose (on health care, particularly) and to negotiate the small victories (children’s health care) that are the guts of practical politics. It is the precise opposite of what Donald Trump–that other exemplar of the baby-boom generation–is selling. It is about patience and making the phone call to the mayor of Flint–or to the Chinese–about what can actually be done to improve things. This celebration of incrementalism is very difficult to communicate in a campaign, under the best of circumstances. And it’s virtually impossible this year, when grand notional gestures–build a wall, ban the Muslims, bomb ISIS until the sand glows–have become the currency of choice. In a way, Clinton is the most (small-c) conservative in the race, standing athwart the utopian fantasies proposed by the left and right. 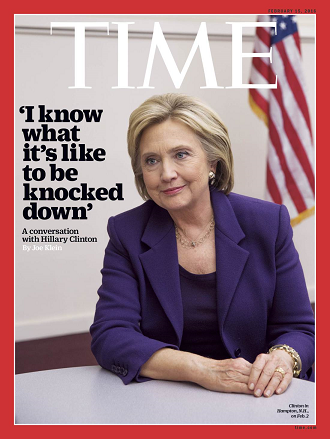 Her gamble is that the toughness and stability she offers will slowly become more attractive in the mayhem of the campaign; her problem is that her very Clinton-ness makes the prospect of stability seem remote. Her cast of characters–Bill, the Clinton Foundation, her email server, Huma Abedin, Sidney Blumenthal, the shameless publicist David Brock–will provide constant fodder for those seeking to outrage or titillate the public. Being “Hillary Clinton” is the single greatest obstacle to her being Hillary Clinton. Läs mer: Joe Kleins intervju med Hillary Clinton. 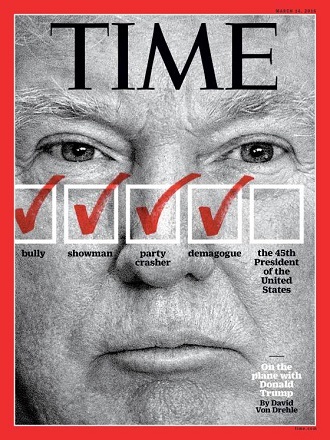 Tidskriftsomslag: Time, 15 februari 2016. Kampanj: Trump går mot en storförlust! Denna reklamfilm har fått många att göra en jämförelse mellan Donald Trumps oförmåga att ta tydligt avstånd ifrån Ku Klux Klan och klanens stöd till Barry Goldwatrer i valet 1964. In 2000, Trump was unambiguous about condemning the intolerance of the Reform Party, because it “now includes a Klansman, Mr. Duke, a neo-Nazi, Mr. Buchanan, and a communist, Ms. Fulani,” he said. “This is not company I wish to keep.” On Friday, Trump was asked about Duke’s support, and replied, “I disavow him, OK?” But somehow, by Sunday, he’d forgotten both who Duke was, and how repellent his ideology is. Om man inte klarar av att ta avstånd ifrån KKK har man uppenbara problem. I ett val där den viktiga väljargruppen kommer att vara svarta amerikaner, och där dessa till övervägande delen röstar på demokraterna, har ingen kandidat råd att göra sådant misstag. För det kan väl inte vara så att stödet från t.ex. David Duke, f.d. ”Grand Wizard” i klanen, anses vara så pass viktigt för Trump att han inte anser sig ha råd att avstå ifrån det? I så fall är det ett säkert tecken på att Trump misstänker att han går mot en storförlust mot Hillary Clinton. Läs mer: ”If You Can’t Understand the Trump Problem, Watch This Vintage Campaign Ad” av Jack Holmes.